Good news everyone! 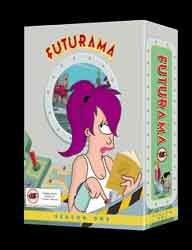 All 13 episodes of the first season of Futurama are now available in this box set. While not quite as anarchic as Matt Groening's more famous animated show, The Simpsons, Futurama is still pretty darned funny. Being a sci-fi spoof, this series has a more focused agenda than the present-day exploits of the denizens of Springfield, and its cast of recurring characters is not as broad (at least, not yet), but then The Simpsons has had more than ten years to establish itself. This three disc set is nothing short of wonderful. well packaged, well designed and well thought out, each disc offers up hours of entertainment of the highest quality. Okay, hype over, what's it really like? Well, fantastic actually. The episodes look great and sound superb and extras really do add that little something extra to the adventures of Fry, Bender and Leela. And while the show has not been the success of its twin The Simpsons, it's just as good in its own way. My only real gripe is the price. When this set materialises in the US expect a retail price of around $30 - that's a shade over £20 in real money - half what we're going to have to pay.